This package features Android version 4.0.3, and includes the kernel and bootloader source codes as well as a Smart ETK. The Smart ETK comprises a number of APIs, including Watchdog Timer (WDT) for safeguarding against system crashes, GPIO access, COM port access, RTC for auto-power on, and a sample app to demonstrate the above function. More information can be found in the VIA VAB-600 User Manual. This package has a pre-built Debian image, including the kernel and bootloader source codes. 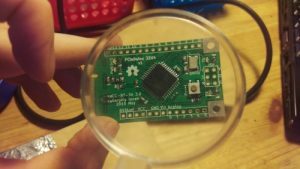 Other features include a Tool Chain to help make adjustments to the kernel and to leverage the onboard pin-headers, GPIO, I2C, and other hardware features. VIA can provide a comprehensive range of services to assist you in taking your prototype to mass production, including customized BSP, OS image, factory test tools, and diagnostic tools. To learn more, please email us at: springboard@via.com.tw. The VIA VAB-600 includes a wide array of rear I/O features, including one Mini HDMI port, two Mini-USB 2.0 ports, one 10/100 Ethernet port, and one 12~24V DC-in jack. Other onboard features include 4GB eMMC Flash memory, 1GB DDR3 SDRAM, one DVO connector, two COM ports (one for TX/RX only), SPI, one USB 2.0 connector, one Mini Card slot touch screen support, front pin headers for line-in/out and MIC-in, I2C and GPIO pin header. Combining a wide operating temperature range of 0°C up to 60°C with extremely low power consumption, the VIA VAB-600 is designed to operate in even the most extreme environments. The board also has a one-year warrantee and longevity support of three years. You can download the following Android and Linux firmware (kernel + bootloader) to configure the VIA VAB-600 as well as associated software development tools. 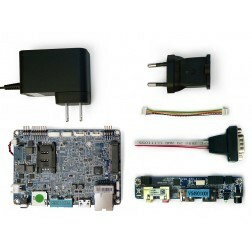 The VIA VAB-600 Springboard WiFi Kit combines an ultra-compact VIA VAB-600 Pico-ITX board with a USB WiFi module, I/O extender card, A/C adaptor, and COM and USB cables, to provide a comprehensive package for developing and building the next generation of wireless connected hardware devices. 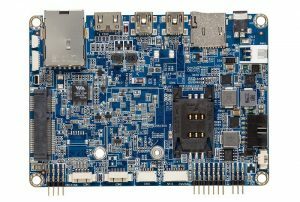 The VIA VAB-600 board contains only one on-board USB port which can be used to enable the two USB ports on the I/O extender card or the VIA VNT9271 USB WiFi module but not both simultaneously. The VIA VAB-600 Springboard Kit combines an ultra-compact VIA VAB-600 Pico-ITX board with an I/O extender card, A/C adaptor, and COM and USB cables, to provide a comprehensive package for developing and building the next generation of innovative connected hardware devices. Taipei, Taiwan, 31st October, 2013 – VIA Technologies, Inc, a leading innovator of power efficient computing platforms, today announced the launch of VIA Springboard, a unique platform developed to provide embedded developers, start-ups, and DIY enthusiasts with the fastest and most stable path for prototyping next-generation ARM-based smart connected devices and taking them to mass-production. The VIA VAB-600 includes a wide array of rear I/O features, including one Mini HDMI port, two Mini-USB 2.0 ports, one 10/100 Ethernet port, and one 12~24V DC-in jack. Other onboard features include 4GB eMMC Flash memory, 1GB DDR3 SDRAM, one DVO connector, two COM ports (one for TX/RX only), SPI, one USB 2.0 connector, one Mini Card slot, touch screen support, front pin headers for line-in/out and MIC-in, I¬2C and GPIO pin headers. Combining a wide operating temperature range of 0°C up to 60°C with extremely low power consumption, the VIA VAB-600 is designed to operate in even the most extreme environments. 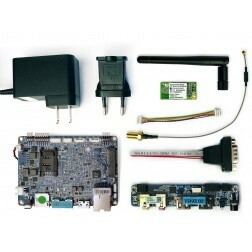 The VIA VAB-600 Springboard Kit and the VIA VAB-600 Springboard WiFi Kit are available for global purchase at www.viaspringboard.com. The kits are priced at $99 and $129 respectively, plus shipping. After coming up with the idea in part 1 for ProtoSpring, the prototyping board for Springboard, and creating the PCB in part 2, this final segment shows the end-result and a demo application – using GPIO to control a 7-segment display from an Android app! After finishing the v1 of the PCB, I’ve exported the Gerber files from KiCad and sent them to Seeed Studio. Looking at their specifications, some of the filenames they require were different from the ones KiCad creates by default (the board outline and the drill files need different extensions). It’s a bit weird, but it’s easy enough to adjust before submission. This entry was posted in Springboard Blog and tagged ProtoSpring, prototyping, electronics, Android on November 7, 2014 by Gergely Imreh. In the first part of this series I’ve outlined the idea of making a prototyping extension board for the Springboard, and finished with a rough schematic. Since then I’ve revised the schematic based on experience, and laid out the prototyping board PCB. By the end of this write-up we’ll have a complete design, ready to send to manufacturing. After making the basic schematic I realized that there’s one type of component on the board that can make or break the entire project: the board-to-board connectors. To interface with the Springboard needed to find 2mm pitch, dual row, through hole, perpendicular mounting female receptacles. I couldn’t find anything like that in the local electronic stores. After an hour of search online they did turn up, fortunately both Digikey and Mouser had the required 3×2, 4×2, and 7×2 connectors by 3M. 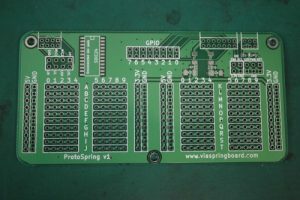 This entry was posted in Springboard Blog and tagged ProtoSpring, PCB, schematic, KiCad, design, electronics on October 28, 2014by Gergely Imreh. I was looking for a project to showcase how easy it is to extend the functionality of the Springboard platform, drawing inspiration from the expansion board that is bundled in the kit. Go is a modern and quite popular systems programming language developed at Google. I’ve recently came across a wiki page describing its ARM support, I thought it would be interesting to check how VIA devices can make use of Go. I’ve checked out the VAB-820, VAB-600, and the APC 8750 boards, all a bit different from each other. I found that the general documentation does not cover all the things that can (and generally do) go wrong, though a few online searches usually pointed me in the right direction. Installing Go needs two separate steps: bootstrapping first, then compiling from source. Bootstrap is needed because Go’s now written in Go, so you need to already have Go to get Go. That makes sense, right? There are two ways go about this (pun intended). Either use another system (e.g. an x86 computer) that can create a bootstrap package for ARM, or use the Go package from the ARM board’s distro. My VIA boards are running Debian, and there the available Go version is pretty old. So instead I opted to an x86 bootstrap. These next steps are based on information at the Install Go from Source page. First downloaded Go 1.4 from their binary distribution page, and put it into the ~/go1.4/ directory as that’s where Go looks for the binaries by default. Bootstrap toolchain for linux/arm installed in /home/user/go-linux-arm-bootstrap. In the settings above the GOOS environmental variable selects Linux, GOARCH selects ARM support in general, and GOARM selects ARMv7 support. Working with these settings, since both VAB-820 and VAB-600 are ARMv7 devices, Other values are listed in the installation guide. To make it easy, I’ve made our current precompiled bootstrap files available for download for ARMv7, ARMv6, and ARMv5. The rest of the steps take place on the board itself. Boot up, and set up networking. Copy the “go-linux-arm-bootstrap-X.tgz onto the board and extract it, for example into the user directory. Clone the Go source as well, and then things are almost ready. Almost, because ARM devices are generally underpowered compared to x86, or at least their CPU/memory/stack balance is very different than an x86 machine. Because of this, some of the settings need to be modified to successfully build Go. Based on a blogpost, the stack size needs to be reduced (e.g. from 8MB to 1MB) with “ulimit -s 1024”, and the Go tests scaling factors need to be modified through an environmental variable. *** You need to add /home/user/go/bin to your PATH. In the process first Go is compiled, then all the tests are run that are included in the source repository. That’s the part that takes the longest time. If all the tests passed, then the new go binary will be installed in the “bin” directory of the git repository – and now ready to use! There’s also a simpler way to possibly get to use Go: turns out that Resin.io, which has (alpha) support for VAB-820, has some Go base Docker images, so deploying an application onto the board can be as easy as a “git push”. This is still very experimental at the moment, so things will likely to change. 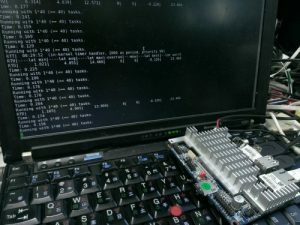 The APC 8750 is an ARMv6 device, and should be okay to bootstrap with a ARMv6 kit, but it turns out that it also depends on the OS version run. The board I had at hand was running soft-float Raspbian, and there the compilation failed with some floating point errors. Looks like that in this case, using a ARMv5 (“GOARM=5”) bootstrap kit might do the trick. The compilation takes quite a long time, though, naturally. As the next step, you can look around at the tutorial section, and at Awesome Go for great project examples and recommended libraries. 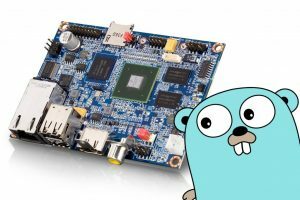 Have you tried Go with any VIA boards, or any other ARM devices? Have any interesting Go project that you want to show off? Would love to hear your experience in the comments! It has been quite a few years since I’ve last used Xenomai, the real-time application framework for Linux, during the work on my thesis back at the university physics lab. When I’ve found that the VIA VAB-820 board is listed on Xenomai’s compatible hardware page, it brought back a lot of interesting memories and I got excited trying it out again. Now that the new (testing) kernel for the VAB-820 is released recently, I thought it’s a good chance to revisit real-time operating systems. Buildroot is a very handy tool to build a kernel and simple file system for embedded devices, and just recently accepted our submitted patch adding support for VAB-820. Buildroot already has support for Xenomai, so everything’s set up to create a system complete with the required patches & tools. One outstanding issue was a bit of adaptation. Xenomai (at least the stable 2.6.4 version I targeted) needs a suitable Adeos I-pipe patch applied to the Linux kernel, which enables secondary real-time kernel on the same hardware (see the Xenomai FAQ). The closest kernel version that had an available patch was 3.10.18, and I’ve backported that to the 3.10.17 kernel used in our latest release (can download the patch from Github). This is not an exhaustive list, there are some dependencies (including the toolchain, I used the latest eglibc), but the required choices are quite obvious during the Buildroot setup using “make menuconfig”. Now I can run make, wait for the compilation to finish (~30 minutes on my laptop), prepare an SD card with the new system, and boot up your VAB-820 or AMOS-820. Of course I want some proof that the system is really running in real-time mode. The Xenomai knowledgebase has a pretty straightforward article on benchmarking with xeno-test, used that as a base to set up my testing environment. dohell is a script that generates load for the latency benchmarks. If there’s no load, it’s very easy for a computer to do things reliably on time, the whole point of real time systems is delivering regardless of the load. Other load include is loading the CPU: that’s what hackbench is used for, “-b PATH-TO-HACKBENCH” tells the script where to find that tool. Also have to tell the script how long to run, in seconds: “7200” = 2h, it does generate very nice plots, though I think you can have pretty good results in “900” = 15mins. Other flags are added to the latency tool running the actual measurements. Here’s “-g result” is telling it to save binned latency measurements ready to be plotted in a file called “result”. Other flags that can be useful is “-t 0|1|2”, which sets the test mode: put 0 there for user mode task timing (this is the default), 1 for kernel mode tasks, or 2 for IRQ timing. For most use cases user mode tasks are the most relevant information. The results are 16.5us mean / 57us max latency for user tasks, 11.6us mean / 43us max latency for kernel tasks, 4.9us mean / 24us max latency for timer IRQ, while being under full load. These are pretty close to the results I could find for other ARM systems out there, so looking good! The upcoming Xenomai 3 is a rewritten version of Xenomai that can provide different ways of creating a real-time system, possibly allowing even stricter response time limits. It’s still in it’s 3rd release candidate form and Buildroot has no support for it, so trying it out would mean once again rolling up the sleeves and do the hard work. Before that, it should be more interesting to find some real use cases for our brand new real-time system that’s running on the board, let it be for example drone control, industrial automation, or scientific research (and gather some inspiration from out there, eg. these slides: Real-Time Linux in Industrial Appliances). If you have real-time OS requirements, would love to hear your experience too! What’s your use case, what are your tools, and experience with them? Leave us a note in the comments!